First announced in 2011, DC Mayor Vincent Gray’s ambitious Sustainable DC Plan was released late last week. Over the past two years, DC government, with cooperation and help from the Metropolitan Washington Council of Governments, has been researching sustainability challenges and solutions, consulting with green building and infrastructure experts, and seeking feedback from citizens. The result is the 129-page Sustainable DC Plan, which Mayor Gray says will turn the District into the “healthiest, greenest, and most livable city” in the United States. Implementation of the plan will occur over the next 20 years. Some parts will occur sooner – Gray wants to push for legislation to accelerate urban agriculture and farming, and the annual planting of 8,600 trees is scheduled to begin this year. Green space is a big focus of the plan – Gray is calling for eight parks to be constructed in areas with limited green spaces, and he envisions more connections between parks, walking trails & biking trails, and public transportation. Other aspects of the plan include energy efficient buildings that contribute electricity back into the grid, more electric vehicle charging stations, and the expansion of the Capital Bikeshare program. For more information, and to read the entire Sustainable DC Plan, see the dcist article here. While Congress avoided the fiscal cliff in January, the sequester (a package of across the board spending cuts) is set to take place this Friday, and will effectively recreate the first half of the recently dodged fiscal cliff. In an article on The Huffington Post, Mother Nature Network’s Russell McLendon discusses the possible environmental effects these budget cuts could have. The first threat would be to the nation’s food safety; Agriculture Secretary Tom Vilsack has announced that if these budget cuts occur, Food Safety and Inspection Service would be forced to send their employees on a 15-day furlough, which would effectively shut down the country’s meat processing. Another big impact would be felt by the National Park Service, which would see a $110 million loss if the sequester goes through. This would have impacts nationwide, as parks would open later in the season, temporary and seasonal employee positions would be cut, and a hiring freeze would be implemented. Scientific research could suffer as well – the National Institutes of Health and the National Science Foundation have said they would be unable to issue the same amount of research grants and awards as in past years, resulting in the loss of thousands of jobs. Finally, FEMA, the Centers for Disease Control and Prevention, and the FDA would all have to make large budget cuts, resulting in less public health safety programs and lowered disaster response. For more information on the impacts of the sequester, please read the full Huffington Post article here. NonProfit Energy Alliance Workshop, Feb. 27, 9:00 am – 10:30 am at Bethesda Green, 4825 Cordell Avenue, Second Floor, Bethesda. Pepco Commercial & Industrial Program, DC Sustainable Energy Utility, and Bethesda Green are working together to host a workshop for participants of the NonProfit Energy Alliance. Participants and other non-profit organizations are encouraged to attend and learn about utility incentive programs that provide cash money for energy efficiency improvements. Attendees will learn about the programs available, savings realized by other organizations, and how to take advantage of these programs. For more information, and to RSVP, please visit the event website. Join GreenWheaton for socializing and networking at their monthly Green Drinks Happy Hour. Learn more about their work toward an environmentally friendly Wheaton, and meet other sustainability-minded Montgomery County residents! Presented by the Northern Virginia Whole Foods Nutrition Meetup Group, this afternoon event will feature local food, health, and wellness exhibits, a screening of the movie “In Organic We Trust” classes on gardening, a local food panel discussion, and lunch by Fields of Athenry Farm-to-Table Kitchen. The event is $10 in advance, $15 at the door. For more information, and to purchase tickets, please visit growyourhealth.eventbrite.com. 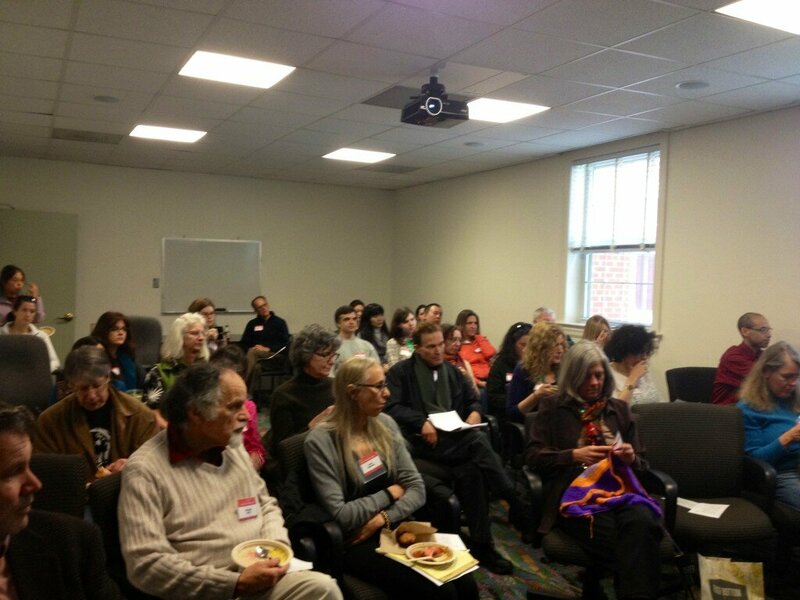 Bethesda Green was bursting with energy and inspiring conversation this past Saturday, February 16. Community members joined together to watch a live webcast of the TEDxManhattan event “Changing the Way We Eat,” held in New York City. Attendees were motivated by speeches discussing innovative ways to change our food system. Among the presenters in New York was Bethesda resident Cheryl Kollin. Cheryl won the TEDxManhattan challenge for a speaker spot on the day-long program and given the opportunity to discuss her Farm-to-Freezer program with thousands of webcast viewers across the country. During the mid-day break in the TEDx program, a delicious pot-luck lunch was enjoyed, followed by a panel discussion of local leaders making a difference in our community’s food system. Cheryl Newman, who chairs the Montgomery County Food Council, moderated the panel, which included presentations about local farms, food insecurity, green catering, and markets that serve both local farmers and customers. Attendees spent the day both listening to new ideas and brainstorming their own through conversation about how we can build a healthier, more sustainable local food system. Lisa Helfert came to the event with hopes of learning more about food issues and “to be apart of a community locally that cares about these issues.” She enjoyed hearing from the panel what people are doing locally and found all the speakers inspiring. Tama Matsuoka’s TEDx presentation stuck out the most to Lisa. After Tama’s speech, which focused on how to turn backyard weeds into delicious meals, she “will never look at weeds the same way again.” This and other speeches drew similar reactions from viewers. I think the best way to summarize what to take away from a day packed full with innovative ideas is a quote from Chef Anne Cooper, “Do one thing.” So, what is your one thing? The 6th annual State of Green Business report, created by GreenBiz.com, was released last Wednesday. This year, the report has undergone changes, both in appearance and focus. GreenBiz.com partnered with TruCost to rework the indicators and metrics used to assess progress and have created a new set of metrics that are comprehensive and global in scope. The new metrics also account for changing technology, the vast improvements in engagement & sustainability efforts, and natural capital – the natural resources provided by the planet that are essential for human survival and economic growth. The report asks the question, “What is positive changes are actually taking place?” and provides the trends and indicators to allow readers to analyze the changes for themselves. The State of Green Business 2013 is available for free download at GreenBiz.com. The Tower Companies are planning to launch a multi-billion dollar redevelopment of The Blairs in Silver Spring, a 50-year-old housing community in downtown Silver Spring. The Blairs, which were built before the Metro extended out to Maryland, covers 27 acres and represents a time when shopping centers were dominated by miles of asphalt. The redevelopment will include the removal of some of the older buildings in the community, the construction of several new mixed use buildings, and a focus on green space, with a series of trails and walking paths used to connect the site to the surrounding community. The parks and green spaces will make up more than three acres of the site and are a part of the Tower Companies’ development philosophy that puts emphasis on sustainable design. The project could take up to two decades to complete, and construction will be staggered to minimize inconvenience for the residents and surrounding community. For more information on the redevelopment plan, please read the full article in Washington Business Journal. Secrets of Scandinavian Sustainable City Planning, Wednesday Feb. 20, 8 – 9:30 am, Bethesda Green, 4825 Cordell Avenue, Bethesda. Don’t miss out! Doo Consulting presents an exclusive event discussing sustainable communities in Malmo, Sweden and Copenhagen, Denmark. Christopher Jakubiak, principal and owner of town planning consulting firm Jabukiak and Associates, Inc., will go over the techniques, best practices, and innovations being used to transform old industrial areas into modern, sustainable communities. To purchase tickets and RSVP, please visit the event page. Renewable Energy Potential on Tribal Lands Webinar, Feb. 27, 1 – 2:30 pm. American Indian land makes up 2% of all U.S. land and comprises 5% of all renewable energy resources. Presented by the Department of Energy and partner organizations, this webinar will introduce the recently released National Renewable Energy Laboratory and ICF International studies on tribal renewable energy resources. Learn about location, siting, and transmission issues, along with opportunities for feasible renewable energy development on tribal lands. If you’re interested in promoting tribal energy self-sufficiency and economic development, this webinar is a can’t-miss event! The webinar is free, but registration is required. Please visit the Office of Indian Energy Policy and Programs to register. Time to form teams and sign up for the 8th Annual Dodging Diabetes Charity Dodgeball Tournament! Last year more than 40 teams competed, and raised over $25,000 for diabetes research and treatment. This year, the event is proud to announce its status as the first sustainable dodgeball tournament in the world! The tournament has achieved sustainability through carbon offsets from a Bethesda Green incubated company, organic cotton t-shirts, food composting, and trophies made from recycled materials. So recruit 6 – 10 people for your team, and vie for glory – tournament champions will not only get bragging rights, but have their team’s picture on a box of Wheaties! For more information, visit www.dodgingdiabetes.org. Going through a slow economic recovery, some start-ups are finding it difficult to secure investors, with green industry entrepreneurs having a harder time than most. According to a recent Gazette.net article, Tom Matzzie, CEO of Ethical Electric, was able to land a green energy venture capital deal late last year — but he was the only one in Maryland to do so. Clean venture funding has fallen 28 percent over the last year, but there is hope; clean technology companies accounted for five of the top 10 deals of 2012. It can be difficult to secure investors without ceding control; investors are trying to get the best deal they can, which may include increased involvement in company operations. The key to finding investors is having the right product, and knowing how to pitch it. Bethesda Green’s Green Business Incubator is helping new companies become investor-ready, which includes finance and investment workshops as well as helping local investors become more familiar with the green mission. The next session of the Finance Workshop Series & Venture Forum, coming up on February 28, will address the different types of investments that can be utilized by early stage companies, and the financing structures related to each. The soil in Indonesian forests is peat-heavy, so by preserving the sanctity of the soil, less carbon will be released from the ground. The plan went into effect February 1. To read the full article, and for pictures of Indonesian deforestation, please visit The Huffington Post. The co-lead sponsors of the bill are Baltimore County Senator Robert Zirkin and Montgomery County Senator Jamie Raskin. For the full story, along with details of the three-point plan, please read the Chesapeake Climate Action Network’s press release. The 8th Annual Spring 2013 Film Series, Wechsler Theater, 3rd Flood, Mary Graydon Center. American University, 4400 Massachusetts Avenue NW, Washington, DC. Hosted by Chris Palmer and presented by the American University’s Center for Environmental Filmmaking and Filmmakers for Conservation, this series of environmental films and discussions is offered free to the public with no reservations required. Battleground: Rhino Wars takes the viewer into the conflict between rhino poachers and a South African anti-poaching unit. The unit, which includes former members of U.S. special forces, finds itself fighting a bloody war as they struggle to put a stop to the cruel, illegal, and highly lucrative trade of rhino horns. Animal Planet’s Senior Director of Production & Executive Producer Erin Wanner will discuss the series, premiering March 7, and reveal the back story of the miniseries’ creation. More details about the film series can be found here. Join the Coalition for Smarter Growth, Smart Growth America CEO Geoff Anderson, and Montgomery County Council member Roger Berliner to discuss the future of Montgomery County public transit. Future transit infrastructure should preserve open space, cut our emissions, and reduce our air pollution – and we can take action to make that future a reality. For details and to RSVP please visit the Coalition for Smarter Growth. Join fellow environmentalists on the National Mall to tell President Barack Obama that the time to act against climate change is now – starting with the prevention of the Keystone XL tar sands pipeline. For more details and to RSVP, visit the event page. Doo Consulting presents Chris Jakubiak on “Secrets of Scandinavian Sustainable City Planning,” summarizing his fact-finding tour of Malmo, Sweden and Copenhagen, Denmark from the perspective of a certified and accomplished City Planner. RSVP — limited seating – breakfast fare will be served. 2013 Green School Summit, March 2, 8:00 am – 5:30 pm, Mary Graydon Center, American University, 4400 Massachusetts Avenue, Washington DC. Are you a building professional interested in green development? Or are you a K-12 teacher that wants their school to become more environmentally friendly? Join the U.S. Green Building Council for the 2013 Green School Summit, and learn best practices for sustainable schools, including administrative policies, technical advancements in green building, and how to include sustainability in your school’s curriculum. The event agenda can be found here and tickets can be purchased through the U.S. Green Building Council. Last week, Bethesda Green hosted the second in its Finance Workshop Series for green businesses. A panel of investment-sector experts — Casey Berman, Jason Shrensky, and Greg Merril — moderated by Anthony Millin discussed what investors are looking for and how to successfully pitch a business. Each panelist highlighted the do’s and don’ts of presenting to an angel investor with real, honest advice. Many attendees were surprised with the openness of the panel as participants were encouraged to approach angel investors with caution. Loren Hurst of Loren Hurst & Associates believed the take away message was that unless you need to, “don’t go to them,” adding that the frankness of answers spoke to the integrity of the event. Entrepreneur Zack Kline of A.I.R. Lawn Care agreed. He has always believed it is best to keep control of his business and focuses on building the brand rather than looking for investors, however, he found the workshop thought-provoking. For Laura Yochelson of Inviting Movement into Life, this was her first finance event and a little out of her comfort zone. Nevertheless, she found it a great opportunity to begin learning what local businesses are trying to do. Full Plate Ventures’ Cheryl Kollin thought the panelists did a great job of speaking about the realities of investing, however, she is more interested in social enterprise investment and hopes to learn more about it in future workshops. Overall, the workshop provided a great opportunity for small, local businesses to come together to discuss challenges they share and how to overcome potential investment hurdles.